Abel Sanchez trains middleweight champion Gennady Golovkin, who Sept. 16 will defend his titles against Canelo Alvarez of Mexico at T-Mobile Arena in Las Vegas (on HBO pay-per-view. During a conference call Monday, Sanchez was asked how cool it is that he and Alvarez’s head trainer – Eddy Reynoso – are currently looked upon as top trainers, instead of say Freddie Roach and Floyd Mayweather Sr., both of whom have gotten a lot of ink in past years. Sanchez replied in prideful tones. 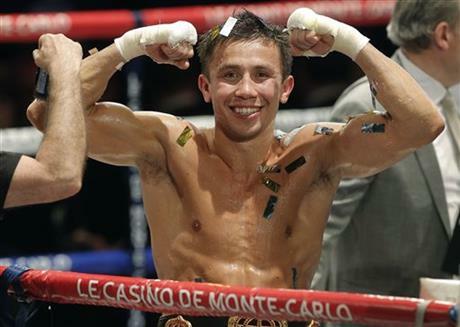 Golovkin, of Kazakhstan, is 37-0 with 33 knockouts. Alvarez is 49-1-1 with 34 knockouts. Gennady Golovkin is a respectful kind of guy. But the middleweight champion can be pushed too far, and this week he sounded off about those who say they want to fight him, but don’t. Golovkin is preparing to defend his belts against Kell Brook on Sept. 10 in Brook’s native England (on HBO). Golovkin was playing host to reporters at the Big Bear camp owned by his trainer, Abel Sanchez, and answered a variety of questions. How about a move from middleweight to super middleweight for a high-profile fight? He’s fed up, it seems, and it all came out. Canelo Alvarez recently gave up his middleweight belt rather than face Golovkin this year. Highly ranked middleweight contender Chris Eubank Jr. seemed all set to sign to fight Golovkin, then backed out. Any time you’re picking a Fighter of the Year, you’d love it to be a no-brainer because there is no second-guessing. It was not that way in 2014, where there was no real obvious winner. Some of those strongly considered here included flyweight champion Roman “Chocolatito” Gonzalez, light heavyweight champion Sergey Kovalev and lightweight champion Terence Crawford. Among others given thought but perhaps not real strong consideration included welterweight champion Floyd Mayweather Jr. and two-division champion Naoya Inoue of Japan. It wasn’t any of them. It was middleweight champion Gennady Golovkin, who is trained by West Covina native Abel Sanchez out of Big Bear. Golovkin, of Kazakhstan, went 3-0 in 2014 – all three fights ending with Golovkin stopping his opponent inside the distance. Golovkin scored a seventh-round TKO over Osumanu Adama on Feb. 1, a very impressive third-round TKO over former champion Daniel Geale in July and a first-round knockout of interim champion Marco Antonio Rubio in October at StubHub Center in Carson. Remember how Mike Tyson used to have opponents quaking in their shoes ahead of fights? Golovkin is beginning to take on a similar persona that is not yet to that extreme, but seemingly moving toward that. The only loss by Rubio in the past five years had been to Julio Cesar Chavez Jr., and Rubio went the 12-round distance with Chavez. Also keep in mind that Geale was 5-0 in world-title fights until losing his title to Darren Barker via split-decision in August 2013, so he was no slouch. Golovkin made him look like one, though. Every time we think of Golovkin, it brings us back to an email Sanchez sent yours truly when he first started training Golovkin in 2010. Sanchez, not the type to go overboard in his assessment of his fighters, said Golovkin was a can’t-miss superstar on the horizon. Sanchez was right. Let’s not forget, Golovkin won his second and third fights of the year – over Geale and Rubio – after his father died suddenly of a heart attack on Feb. 18 at the age of 68. For a fighter to have to pull himself together after that kind of tragedy has got to be the hardest thing. Golovkin, 32, is 31-0 with 28 knockouts. That’s a knockout ratio of 90.3 percent. Touching on a few of the others who did not get the nod here but had very good years, very impressive was what Gonzalez accomplished. He went 4-0 with all four victories by TKO. He won the flyweight world title with his third win of the year – a ninth-round TKO over Akira Yaegashi – and then defended that belt with a sixth-round TKO over Rocky Fuentes. Interestingly, three of Gonzalez’s four fights were in Japan. Gonzalez, 27, is from Nicaragua. Also substantial was what Kovalev did. He went 3-0 with two knockouts. He defended his title against Cedric Agnew (KO 7) and Blake Caparello (TKO 2) and won a very wide unanimous decision over ageless wonder Bernard Hopkins in a light heavyweight title-unification bout. We also really liked what Crawford did in 2014. He ventured to Scotland to win the title with a unanimous decision over Ricky Burns, then defended it twice in his hometown of Omaha, Neb. First, he stopped Yuriorkis Gamboa in the ninth round, then he won a unanimous decision over Raymundo Beltran. Good stuff by all of these fighters. They are to be commended. The aforementioned Sanchez is our Trainer of the Year. The reason whys are quite simple. Keeping in mind that we like what several other trainers did, Sanchez was charged with helping keep a heartbroken Golovkin in the proper frame of mind once he began training again after some personal time to heal. And Sanchez was just the trainer to do that. Sanchez, who trained former junior middleweight champion “Terrible” Terry Norris, is that cool personality that fits perfectly with a caring and sensitive yet absolutely vicious fighter like Golovkin. Also, Sanchez encourages Golovkin to be the most destructive fighter he can possible be; he knows that’s what the fans crave. Middleweight champion Gennady Golovkin is currently in Big Bear training for his July 26 title defense against Daniel Geale at Madison Square Garden in New York City (on HBO). With a record of 29-0 and 26 knockouts, Golovkin has become one of the most feared champions, and one of the most talk about. But his meteoric rise doesn’t mean he’s going to start changing things. Certainly, not his diet. His trainer, Abel Sanchez of West Covina, said as much this week from Big Bear. “Not really a particular diet, no sugars, fats or sodas,” said Sanchez, who was talking about Golovkin’s overall training regimen, which partially consists of running five miles three times a week and sprints twice a week. “Just a balanced diet. Gennady eats pretty much what he wants, but he’s very smart about what he eats in camp. Heavyweight contender Mike Perez of Cuba this past Saturday fought to a 10-round majority draw with Carlos Takam of Cameroon in Montreal (on HBO). He was expected to defeat Takam, but his trainer – Abel Sanchez – said Perez didn’t seem to have the same fire he had in his previous fight. Perhaps, for good reason. On Nov. 2, Perez won a 10-round decision over Magomed Abdusalamov, who afterward was hospitalized with a serious brain injury. Abdusalamov survived, but he will never fight again. According to Sanchez, Perez (20-0-1, 12 KOs) answered way more questions about Abdusalamov and his injury ahead of Saturday’s fight with Takam, than he did about the fight with Takam. Sanchez said that in one interview with ESPN that was centered heavily on the fight with Abdusalamov, Perez became teary-eyed and had to ask for a break. Sanchez said that before his fight with Abdusalamov, Perez was chomping at the bit to get in the ring. “When we were warming up, he was animated, pounding the gloves,” Sanchez said. Juan Funez of Reseda is what we call a prospect. The super featherweight is 3-0 with one knockout, he is talented and he is a southpaw. He’s trained by his uncle, Ricky Funez, with an assist from world-class trainer Joe Goossen out of Goossen’s gym in Van Nuys. Funez and his team have gone up to Big Bear to finish training for Funez’s fight Jan. 24 against Marcello Gallardo (3-0) at Little Creek Casino Resort in Shelton, Wash. on the undercard of the light heavyweight main event between Thomas Williams and Cornelius White (on ESPN2). It seems Team Funez wanted to get its young fighter some time with some world-class fighters. Since the training in Big Bear is being done at Abel Sanchez’s gym, that means Funez is spending time with middleweight champion Gennady Golovkin and heavyweight contender Mike Perez, both of whom are trained by West Covina’s Sanchez. Among other things, Funez has been running the mountains with Golovkin and Perez. “I believe Juan has the tools to become an exciting world-class fighter and Joe and I are prepared to do everything to make sure he reaches his goals,” Ricky Funez said. Abner Mares of Hawaiian Gardens had already won titles in the bantamweight and super bantamweight divisions when he challenged Daniel Ponce De Leon for his featherweight title this past Saturday at MGM Grand in Las Vegas. Not only was Mares moving up in weight, he was facing a left-handed power hitter in De Leon. Mares went right after De Leon and stopped him in the ninth round to become a three-division champion. As impressive as Mares was, trainer Abel Sanchez of West Covina believes we have yet to see his best. “Just like Floyd (Mayweather), he seems to be getting stronger and better at the higher weights,” said Sanchez, who trains middleweight champion Gennady Golovkin out of his sprawling camp in Big Bear, Calif. “When he gets to 130 (super featherweight), he’s going to be an even better fighter. He has good mobility, he was able to withstand Ponce De Leon’s punching; De Leon’s a strong puncher. De Leon appeared to be a good 10 pounds heavier than Mares at fight time. Mares, 27, on Monday at 6 p.m. will be recognized by the city of Hawaiian Gardens at a special city council meeting.